Calyx brownish purple, with 3 long-tailed lobes 1–3″ long [2–8 cm]; no petals; 12 stamens ± fused to the pistil; flower single on a prostrate short stalk under the paired basal leaves; leaves heart-shaped, 2–5″ long [5–12 cm], finely hairy, spicy-aromatic, rather firm and often persistent in winter, on hairy 2–8″ [5–20 cm] leafstalks. 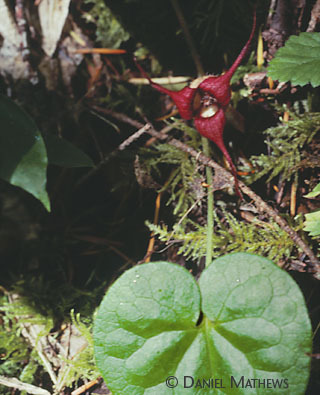 Habitat: Moist deep forest at low to mid-elevations, more abundant coastally; WA, OR, ID, MT, BC. with cooks of trapping, pioneering, and wild-food-stalking eras alike. The earthbound, camouflaged flowers are less fragrant. 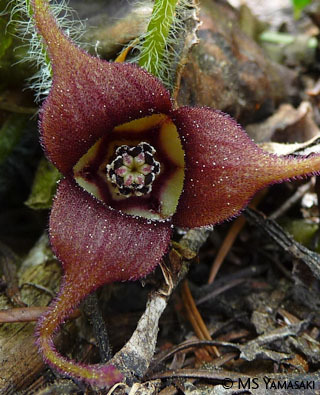 They ­attract creeping and crawling pollinators.